What Does Christmas Mean to this Atheist? For this post I thought I would just give my own personal view on what is ultimately a personal issue: the meaning of Christmas for me as an atheist. Christmas to me is a time of lots of bad childhood memories, a few good childhood memories, some great adult memories, conflicting emotions, and a good bit of sadness. Not exactly the Rockwell version of things. Christmas, when I was a child, was a time of constant preaching by my father about the evils of the season. He was a member of the Worldwide Church of God, a particularly fanatical sect of Christianity* which held that the end was nigh, and that Christmas, along with Easter, Halloween, and even birthday celebrations were evil rituals from that most evil of institutions, the Catholic church, designed to lead good Christians away from the teachings of Christ and into the arms of Satan. I never remember believing in Santa, or the Easter bunny. It was OK to beat a child into believing in and being scared to death of Jesus, but not OK to allow him the hope of Santa, or the Easter Bunny. While most of the kids I went to school with were busy figuring out Christmas lists, and anxiously awaiting Christmas Day, I was being drilled on all of the evils of the Popes***, and punished for any infractions, like watching Rudolph at a friend’s house, or making a construction paper chain during crafts time at school. For the most part I hated the month of December, because my birthday and Christmas both fall therein, and both of them were reminders of just how miserable my Christian upbringing made things. The only bright spots during that miserable season were the two weeks out of school, and my grandmother who always used “I am your mother, and you don’t tell me what to do” as a way to circumvent my father and get my brothers, sisters, and me at least one gift. The Christmas I got a Six Million Dollar Man action figure** from my grandmother is still one of my fondest memories, and I might add, a story that I am sure my children are quite tired of hearing. I got out from under my father as quickly as I could by enlisting in the Army at seventeen and going to basic within a few months of graduation. 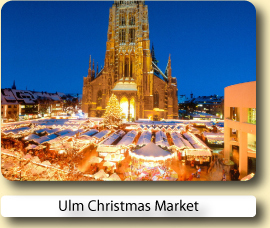 And it was while stationed in Ulm/NeuUlm Germany that I was finally able to free myself from the childish fantasies about God and embrace the concept of Santa. The “Old World” really knows how to celebrate the holidays, and I eagerly joined in. Many of the traditions I engage in every year are rooted in my time in Bavaria during the Christmas season. Though while there, most of the traditions I eagerly engaged in revolved in some way around copious amounts of Hefeweizen. It was there that I learned that Christmas is a good excuse to enjoy life, friends, and later when I got out of the Army, family. The religious side of the whole thing was, to me, a quaint little leftover from the middle ages, like the Maypole in spring, or the harvest celebrations in autumn. After the Army I went to college at a small Catholic University where I met a beautiful Irish Catholic girl who would eventually become my wife. She, more than anyone shaped my current views on Christmas. I never hid my views on the existence of God, but I also never fought hers, so it was rarely an issue. She absolutely loved all the Christian and secular aspects of Christmas, and took it upon herself to make me see what a wonderful time of year it could be. It was through my wife that I embraced what I call the concept of Santa. Santa, more than anything else, embodies the ideal of Christmas. It is Santa, not Jesus, who brings all the happiness and joy to children, because it’s Santa who brings the gifts. It’s Santa who is the central character in the Christmas stories and television shows that become family traditions, and in the charity which increases during the holidays. When a person focuses on being Santa-like to his or her children, friends, family, and neighbors, they become, if only for a few weeks, a happier and better person, and it is this Santa quality that can make this time of year a season of happiness and joy, even for people for whom the rest of the year is a miserable grind of poverty and the struggle to survive. It was in no small way, that very quality in my Grandmother which provided a small sparkle in my own miserable, poverty-ridden, mythology infused, childhood. 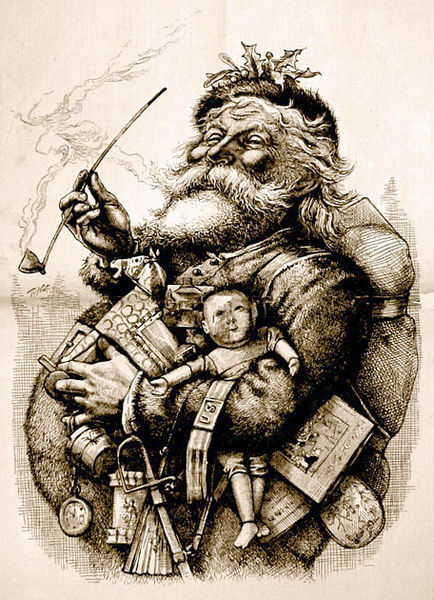 When I had children of my own, I gleefully engaged in the whole Santa Claus myth, and enjoyed more than most the acting out of Santa on Christmas eve. I even enjoyed going to midnight mass with my wife. It was one of two times a year that my wife insisted I attend mass for the sake of family, the other was sunrise mass on Easter, and I never really had a problem with it. Christmas took a huge downturn when my wife died, since she had been the reason I had begun to celebrate so wholeheartedly to begin with. But, my children were still toddlers, 14 and 30 months respectively, that first Christmas without her, so I have always made a concerted effort to make Christmas for them every bit as wonderful as their mother had made it for me. My atheism plays no real part in my celebration of the Christmas season aside from my not engaging in the bitterness, divisiveness, and stupidity that Christianity brings to the table for this holiday. It is my lack of religious beliefs that allow me to enjoy the holiday for what it is. Christmas is a time for enjoying the good that my life has given me, accepting the bad, and reveling in the life around me. That’s what Christmas means to this Atheist. *-Some call the WWCoG a cult, which in principle I would agree with, however all the tens of thousands of various Christian sects, could be called cults, and the original one which became the Catholic and Eastern Orthodox churches was also a cult in the traditional sense of the word. I plan on a post about my life with this fanaticism, but it’s proving to be pretty painful to write about. **-I still have the action figure. It is a traditional Christmas decoration. ***-When I was growing up I was taught that the new pope at the time, John Paul II, was the actual anti-Christ. Dad had no explanation when John Paul II died. To his credit, he didn’t bring up his belief about the Pope around my wife. 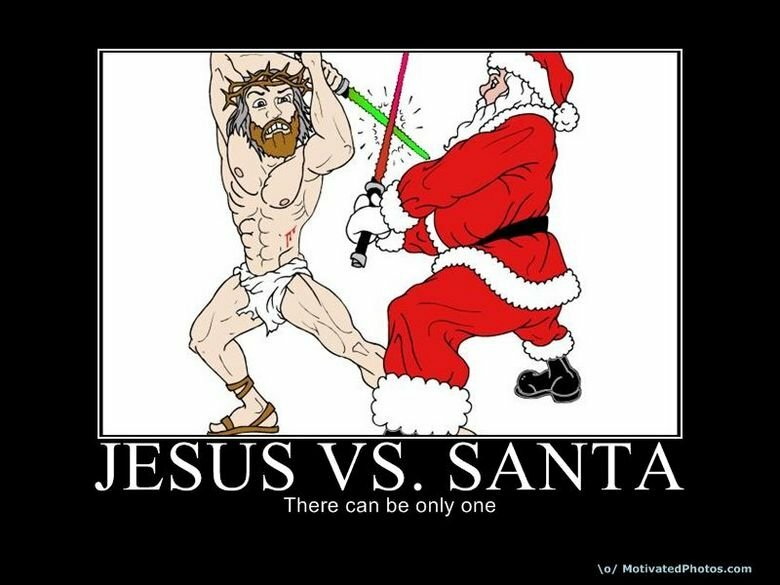 This entry was posted in Uncategorized and tagged Atheism, Christmas, Christmas Spirit, Fairy Tales, Holidays, Santa, Worldwide Church of God on December 15, 2013 by Atheist Ron.